Included is the the Gopro Hero 4 HERO4 BLACK featuring a Professional 4K30, 2.7K60 and 1080p120 video, 720p240 video for playback in super slow-motion and 12MP resolution for photos taken at up to 30 frames per second + Smart Remote, Built-in Wi-Fi and Bluetooth and much MORE. The Kit includes: a 64GB High-Speed Memory Card + 2 AHDBT-401 Batteries + Dual charger that conveniently enables to charge 2 batteries at once + Custom Large Case with removable foam interior designed to fit the Gopro Hero 4 Camera plus extra gadgets and Accessories. In addition the Accessory Kit Includes a 3 in 1 Selfie Stick Monopod Pole with extra mounts to enable filming with a GoPro Camera / regular Digital Camera and Smartphone + a Suction-cup Car Mount, ideal for capturing film while on the go by attaching it with the suction cup to various surfaces + an adjustable Bike Mount designed to be attached to a Bike Handlebar or any similar object. Additionally the Kit includes a Head Strap Mount with adjustable buckles and straps designed to fit all sizes + Adjustable Chest Strap Mount + 2 Chest Strap J-Hooks both great Accessories for capturing Hands-free Pictures + a Helmet Harness Mount designed to Attach onto a Helmet or a similar object + 8 VHM Surface Mounting Stickers + 4 Flat Surface Mounts + 4 Curved Surface Mounts + a Handheld Hermetically Sealed Floating Bobber, an ideal accessory for filming above or underwater + 2 Screen Protectors + Mini table tripod + Memory Card Wallet Case holder + Lens Cap Keeper + a cleaning pen + air blower + a Deluxe Cleaning Kit and a HeroFiber® Ultra gentle cleaning cloth designed for cleaning electronics and accessories. Includes the Gopro Hero 4 BLACK Edition featuring a Professional 4K30, 2.7K60 and 1080p120 video, 720p240 video for playback in super slow-motion and 12MP resolution for photos taken at up to 30 frames per second + Smart Remote, Built-in Wi-Fi and Bluetooth and much MORE. 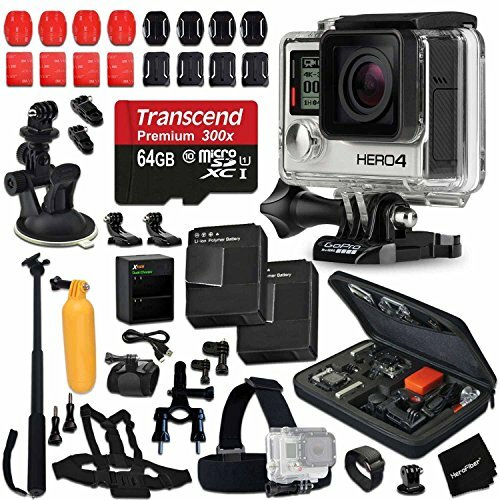 Includes a 64GB High-Speed Memory Card + 2 AHDBT-401 Batteries + Dual charger that conveniently enables to charge 2 batteries at once + Custom Large Case with removable foam interior designed to fit the Gopro Hero 4 Camera plus extra gadgets and Accessories. Includes a 3 in 1 Selfie Stick Monopod Pole with extra mounts to enable filming with a GoPro Camera / regular Digital Camera and Smartphone + a Suction-cup Car Mount, ideal for capturing film while on the go by attaching it with the suction cup to various surfaces + an adjustable Bike Mount designed to be attached to a Bike Handlebar or any similar object. Includes a Head Strap Mount with adjustable buckles and straps designed to fit all sizes + Adjustable Chest Strap Mount + 2 Chest Strap J-Hooks both great Accessories for capturing Hands-free Pictures + a Helmet Harness Mount designed to Attach onto a Helmet or a similar object + 8 VHM Surface Mounting Stickers + 4 Flat Surface Mounts + 4 Curved Surface Mounts. Includes + a Handheld Hermetically Sealed Floating Bobber, an ideal accessory for filming above or underwater + 2 Screen Protectors + Mini table tripod + Memory Card Wallet Case holder + Lens Cap Keeper + a cleaning pen + air blower + a Deluxe Cleaning Kit and a HeroFiber® Ultra gentle cleaning cloth designed for cleaning electronics and accessories. If you have any questions about this product by HeroFiber, contact us by completing and submitting the form below. If you are looking for a specif part number, please include it with your message.